Working with moving image produces it’s own specific range of display challenges. As well as thinking about the method of display you also have to consider the installation in the space and the experience of encounter. I have a number of moving images that I can include in my installation in January and I’m thinking around which ones to use, which ones to edit out, how they should be encountered, what size they should be. I’m working with an AV company to come up with the best method for the work, the best method for the space and the best method for my budget! I looked into technology that was way beyond what I can afford right now (like fog screen technology) but it’s good to have that in my arsenal for when I have works that might suit those display techniques and I have budget to make it happen. I’ve spent some time researching methods of display using projection and LCD displays as these are the 2 most likely display methods I would use. I have also built a 1/20 scale model of the gallery space with removable internal walls so I can have a look at the size of LCD monitors in the space, positioning of projectors, which images could go where. This has been incredibly useful for me as well as for my collaboration with the AV hire company. Yolanda and I had a look at some of the images projected in the lecture room and I feel that the large-sized presentation is definitely right for 3 of the images at least. My challenge then is to create a darkened space for the projection by building a lightweight false ceiling over the back half of the gallery space. My thinking then would be to have 2 more moving images in the entry spaces on either side of the doorway and to display those slightly differently on large LCDs. I like that order of encounter and the size difference – the areas of moving image are related but different with speed, movement and composition. I like this simple projection strategy that uses a paper strip screen and movement from a fan. It’s a god way to break away from the traditional screen and bring movement into the work. I thought about these sorts of unusual screen ideas for my work but I felt that the content and detail of the imagery was too integral to the work to be split apart and diffused in this way. 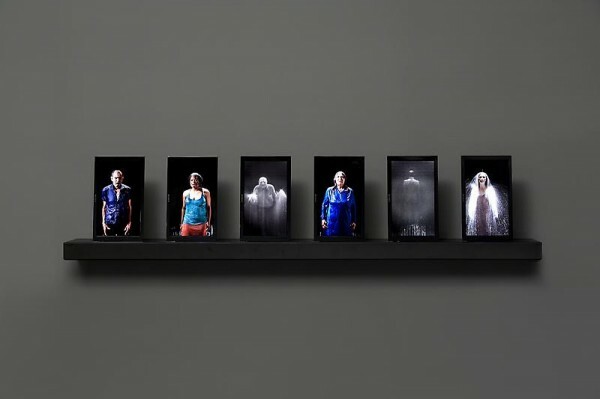 It’s useful for me to look at Bill Viola’s installation strategies as he is also using singular iconic figures, performing to camera against an amorphous background. 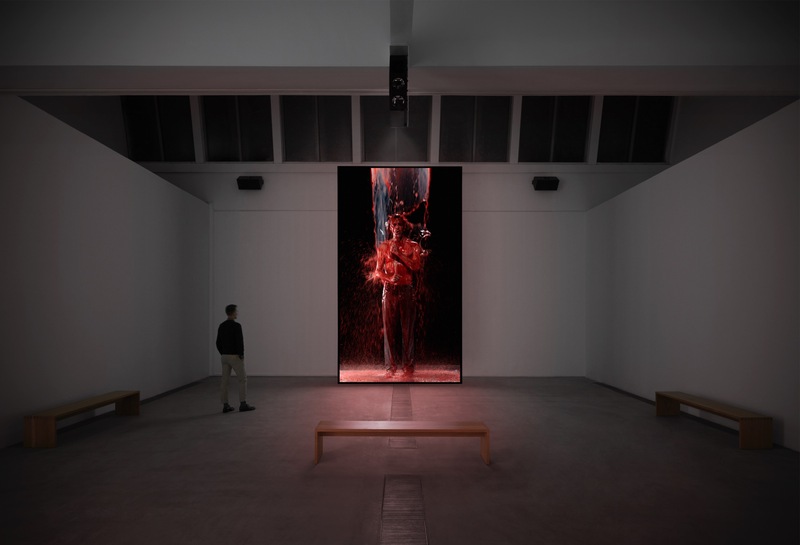 The single, large projected image in Inverted Birth is impressive in it’s size and looming position of the viewer. The 4 martyrs are displayed like a modern altarpiece which is a nice conceit but I feel they are a bit small at this size and would benefit from being more imposing. The Small Saints series is a different approach, making the images more intimate and photographic, like something you might have on your mantelpiece at home. It’s a really different approach from what Viola usually takes and I’m keeping it in the back of my mind for future consideration when I have works that might suit a more intimate approach. I love Yorgo Alexopoulos’s use of multiple changing screens. The above work Transmigrations uses screens grouped into clusters. 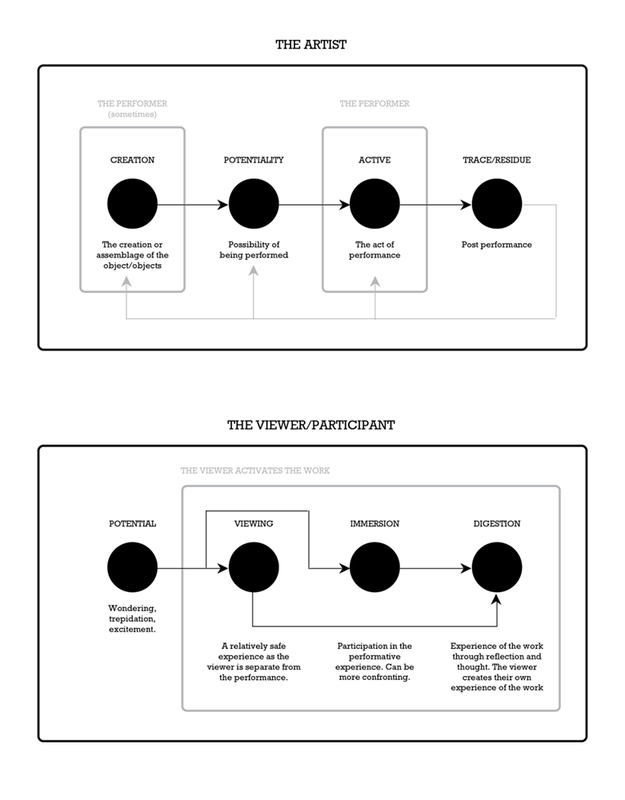 It made me think about using screens of differing sizes, orientations and placements. 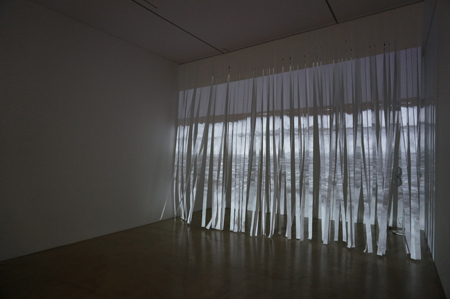 This is an interesting method of installation, creating an enveloping ‘room’ from the video. In Crude Carrier the video moves around the 3 screens so it can be viewed as a continuous movement. 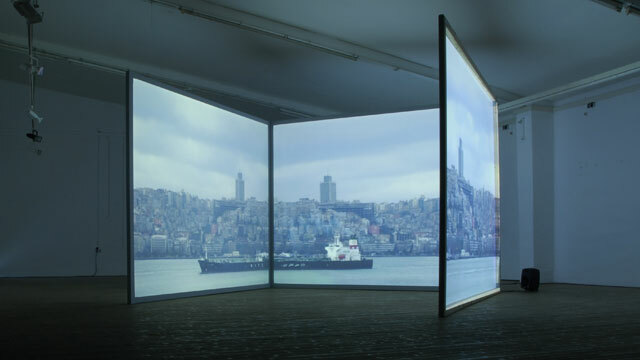 The images can be viewed from within and without of the ‘room’. The screens are moveable and can also be opened out or mounted flat onto a wall. There is a naturalistic soundtrack with the sounds of water, boats, seagulls and traffic. I’m looking into this sort of installation strategy for my current work although it may not be possible or right for the work. 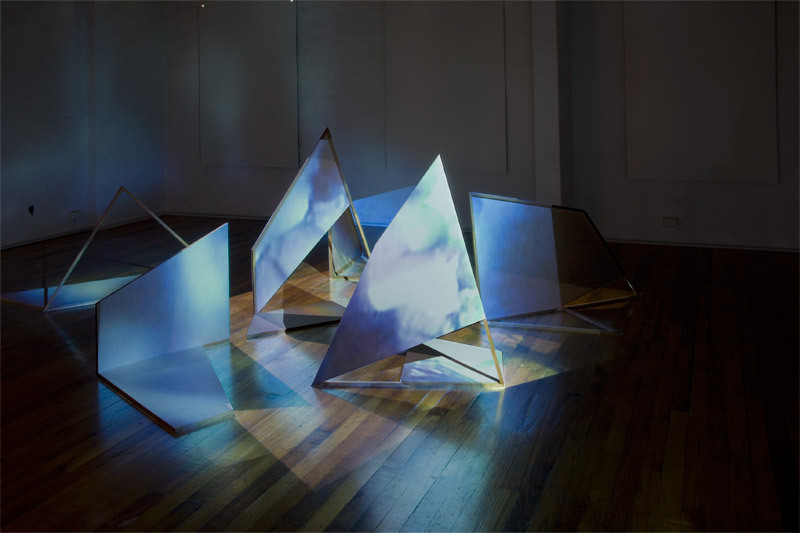 Projecting onto sculptural objects or uneven surfaces (rather than the traditional screen) is another option I have considered. I think that for this series of works, much like with the moving paper screen, the content of the videos would be broken up and distorted too much with this method but it’s something I could consider for future work. 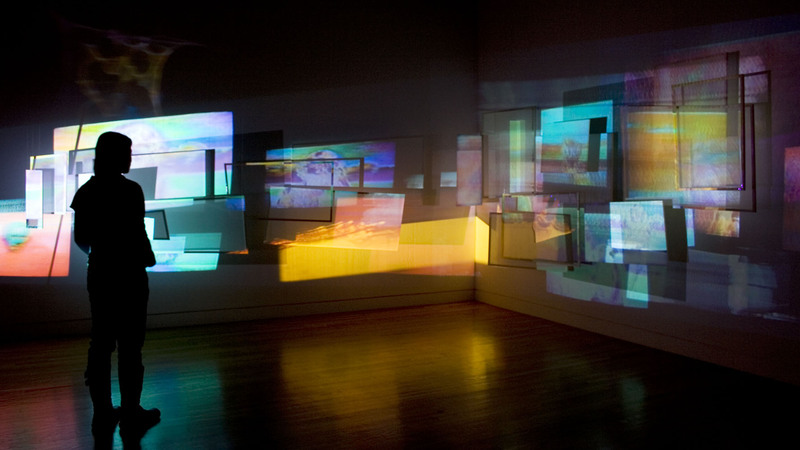 I was interested in the chaotic nature of this work, from the multitude of randomly hung screens and frames on the walls so the overlapping and changing projections. Obviously this isn’t a suitable strategy for my current work, but it’s so different to what I would usually think of doing myself that I got really drawn into it. So here are some examples of the strategies I’m considering using my scale model. I have more videos than I need which gives me scope to change and edit the installation. 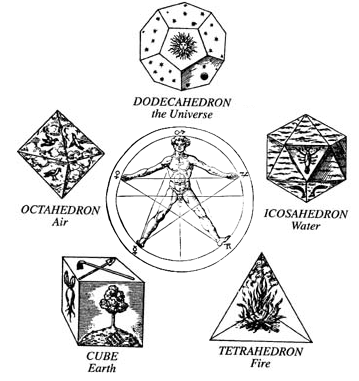 Long later, man developed the idea of connecting phenomena, at least a few at a time. Centuries elapse; he begins to perceive law, at first operating only in a very few matters. More centuries; some bold thinker invents a single cause for all these diverse effects, and calls it God. This hypothesis leads to interminable disputes about the nature of God; in fact, they have never been settled. The problem of the origin of evil, alone, has quite baffled theology. Science advances; we now find that all things are subject to law. There is no need of any mysterious creator, in the old sense; we look for causes in the same order of nature as the effects they produce. We no lounger propitiate ghosts to keep our fires alight. Now, at last, I and a few others are asking whether the whole universe be not illusion, in exactly the same way as a true surface is an illusion.